Need a fun way to incorporate some physical activity in your weather & earth systems lessons? The Reasons of the Seasons created by M. J. Krech gives your students an engaging and active way to learn about the earth’s seasons. Students will physically demonstrate the tilt and orbit of the earth in order to understand the conditions that create our seasons on earth. 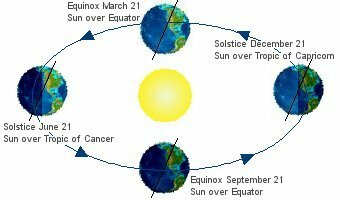 A common misconception regarding the seasons is that the summer season is caused when the earth moves closer to the sun, and winter is caused when the earth moves farther away. In fact, we are physically closer to the sun during the winter months of the year. Earth does not orbit in a perfect circle, but rather in an elliptical, oval shape. The earth’s closest distance from the sun, known as perihelion, occurs around January 3. The farthest point we reach from the sun, known as aphelion, occurs around July 4. In order to fully understand the earth’s seasons, it is important to understand the tilt of the earth’s axis. Earth does not stand straight up, but on a 23.5 degree tilt from its plane of orbit. This tilt means that during certain months, the southern hemisphere experiences warmer temperatures while the northern hemisphere experiences colder temperatures. The tilt itself does not change directions as it orbits around the sun every year. The tile of the earth during different parts of the year affects how much direct sunlight a hemisphere receives on a daily basis. For the northern hemisphere that receives hotter temperatures during the summer months, the tilt of the earth faces them more directly towards the sun. On the other hand, those countries in the southern hemisphere will receive less direct sunlight during those months. More direct sunlight and longer days leads to hotter average temperatures, and thus a warmer summer season. Your first step should be to find a large enough indoor space for groups to move around comfortably. Here are the steps for the four activities provided by the author. I will provide the basic instructions to give you an idea of what the activity entails. You should refer to the PDF for more detailed instructions. Place a lamp fixture in the center of your classroom. Tape the electric cord to the floor. Remove the shade and place a large soft white bulb in the lamp. Turn on the lamp and turn off the classroom lights. Have student teams (four is good) hold an Earth globe and walk around the lamp (sun) modeling the orbital path of the Earth. Each team can walk as a team. What Season are you at now, Team One? Are we closer or farther away for this season? What season is the Southern Hemisphere experiencing now? At what angle is the Earth pointing toward the Sun? What is the Special Day called? Date of that Day? which now represent the Sun. black laminated card with the one inch hole between them. be an oval, larger than 1 inch across.] This is called Indirect Sunlight. height of about 15 cm. Trace the lighted area with a pencil. Label #1. Change the angle of the flashlight to about 30 degrees. Hold the flashlight at about 15 cm above the paper. Trace the area. Label #2. If the flashlight were sunlight, which angle would heat the paper the most? In general, where would the world have higher temperatures? If the flashlight were sunlight, which angle would heat the paper the least? In general, where would the world have lower temperatures? How would the angle of sunlight affect the temperature of the lighted area? Compare Jefferson City to Miami, Florida, using what you’ve learned in this lab. I’ve had the opportunity to implement this activity with my own students. My students enjoyed the opportunity to get up and move around and they showed a lot of enthusiasm for this particular activity. I find that kinetic activities are a great way to reinforce concepts or help those learners who learn by doing rather than by watching or listening. In order to implement this successfully, it is important to plan and organize the logistics of the activity beforehand. It can be easy for kinetic activities like these to get clumsy or clustered, so it is important to plan out the logistics beforehand. It is also important to have enough space for the needs of your class in order to avoid any physical injury. This model of the solar system can explain eclipses of the sun and the moon. Earth’s spin axis is fixed in direction over the short-term but tilted relative to its orbit around the sun. The seasons are a result of that tilt and are caused by the differential intensity of sunlight on different areas of Earth across the year.